We are a summer day camp for girls and boys that aims to makes sure every camper has the best summer ever! We believe that summer is a time for fun and adventure, and our dedicated staff of McGehee faculty and alumnae work tirelessly to create an environment that promotes an environment where campers have fun, make new friends, and try new things. We pride ourselves on a low camper-counselor ratio, allowing us to customize each camper's experience so that they can maximize their summer fun! Contact us using the information to the right or at summer@mcgeheeschool.com. Summer at McGehee 2019 is all about fun! The perfect summer adventure for your camper is closer than you think: new experiences, new projects, new friends, and new fun! Camp runs from 9:00 a.m. to 3:00 p.m. from Mondays to Fridays. Before Care runs from 7:30 a.m. to 9:00 a.m. Aftercare runs from 3:00 to 5:30 p.m. Enjoy dress-up days, field trips, weekly themes, special events, water play, and all the exciting fun you've come to expect from Summer at McGehee. Staffed and operated by McGehee teachers and counselors, your camper is sure to have a blast. Incredibly low student-teacher ratio. Sign up for one week or all six. Summer at McGehee 2019 geared for 7th and 8th grade girls and boys! Open to girls and boys in the 7th - 8th grades. Camp runs from 9:00 a.m. to 3:00 p.m. Mondays to Fridays. Leadership training in the morning, where CITs learn all the skills they'll need to be great counselors. CITs will be the official camp photographers and videographers, equipped with iPads and cameras to ensure they don't miss a thing! 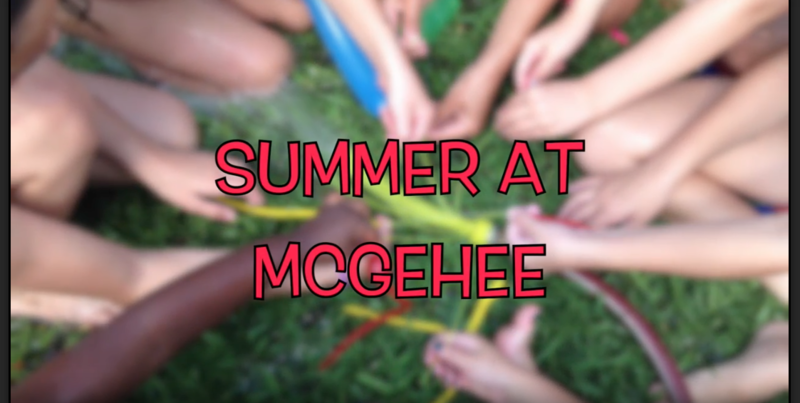 Summer at McGehee 2019 is developed around activities that give children the opportunity to grow, build relationships, and build self-confidence and self-esteem! Our range of explorations offer a variety of memorable experiences for our campers ensuring a summer of creativity, skill building, friendship, and most importantly FUN! Before Care is available from 7:30 to 9:00 a.m. Aftercare is available from 3:00 to 5:30 p.m.
Each day will provide time for uninterrupted play both indoors and out, with daily Water Play! Our campers will enjoy a variety of Arts & Crafts, Science Experiments, & Gardening fun! We will have weekly water inflatables and snowballs as well as dress up days! Our camp is staffed by Little Gate teachers to ensure an easy transition. Sign up for 1 week or all 6! Team Challenge was my favorite part of every day at Summer Gate! We played games against each other every day in the gym! I loved the small size and the focus on girls' leadership. The staff seemed to really help my child recognize the need to participate in a range of activities. Weekly sign-up for flexible summer planning! Camp runs from 9:00 a.m. to 3:00 p.m. (Extended Care 7:30 a.m. to 5:30 p.m.) Mondays to Fridays. PK-6th Grades camp and CIT program: weekly tuition of $250 with $100 non-refundable weekly deposit required at registration. Little Gate camp: weekly tuition of $270 with $100 non-refundable weekly deposit required at registration. Before Care will run from 7:30 a.m. to 9:00 a.m. for $10/day. Pre-registration preferred. Aftercare will run from 3:00 p.m. to 5:30 p.m. for $20/day. Registration preferred. Per the Business Office, if your child is not picked up by their enrolled time a late fee of $15 will be charged for the first 15 minutes and $2 per minute thereafter! Camp tuition includes all activity fees, camp supplies, and daily snack. Campers should bring their own lunch or sign-up for weekly lunch offerings at Café Louise. All deposits are nonrefundable. Full payment for registered sessions becomes binding seven days before start of week enrolled. Register via CampBrain starting January 7th!! !